On Wednesday I talked about how difficult it was to learn how to meditate. What helped me over the hurdle, was approaching this discipline like I did learning anything new: begin slowly, one step at a time. After all, I did not achieve a perfect somersault on my first attempt in gym class, but within a few minutes I was rolling around the mat like a bowling ball. They were fun! 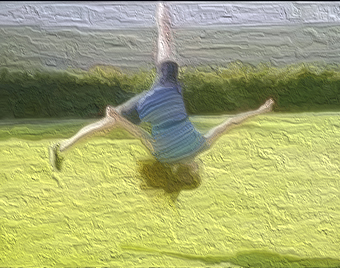 I didn’t learn how to perform an aerial cartwheel until years after I perfected the one-handed version. I didn’t learn how to write on my first attempt. In fact, I still vividly recall when I was two, my paternal grandmother trying to teach me the Greek alphabet. Each time I attempted to write the letter epsilon (“E” in English) I couldn’t remember how many short strokes the capital “E” had, so my first attempt at “E’s” looked more like hair combs than a letter of any written language. Realizing that nothing is easily accomplished on the first attempt was my breakthrough. When my inner voice stopped asking questions, or criticizing my lack of progress and I shifted my thoughts from my perceptions of what meditation should be, I began to learn how to appreciate and enjoy that quiet time, no matter what thoughts popped into my head. Rather than judge them for defying my intent to quiet the mind, I eventually learned to smile, and welcome them, even giving thanks in acknowledging they were there. 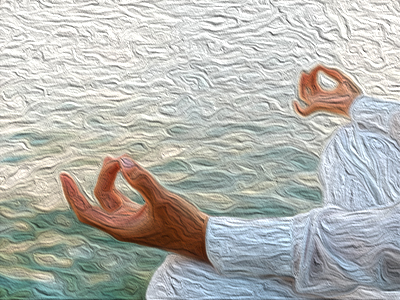 Since then, I have participated actively in many forms of guided and non-guided meditation, both with equal benefits. Each time I did not include it as a part of a regular practice, I found I was unable to achieve optimum levels of health and performance outcomes. Now that I have added this practice back into a regular schedule, I continue to experience positive effects in my physical well being, emotional health, and relationships. I even look forward to my meditation and exercise sessions now. In fact, a ten minute meditation now feels like a mere few seconds … and there are times when even a half hour goes by like five minutes! The good news is that meditating is not the challenge it once was, the bad news is, that when the session is over, I feel like a kid at an amusement park who just finished a thrilling ride and wants to go on again! The audiobook versions of my eBook publications which are currently available on amazon.com, audible.com and iTunes, Ethics in the Real World and Breaching Communication Barriers, include short mindful practice bonus tracks at the end of each title. These short tracks were developed using the principals of positive thinking. The five-minute audio tracks were created to help encourage productive communication and ethical behavior with techniques that integrate the power of intention with the laws of attraction. They are meant to be used for short breaks to revitalize energy and focus the mind to help individuals operate from a more balanced state of mind. These work great for people with uber busy schedules. They are meant to provide choices other than coffee or cigarettes for reboot internal systems at break time. Let’s face it, no matter how old we get, we all still enjoy, and frankly need to schedule a little recess time as a picker-upper. Traditionally, when we take breaks we will seek escape from substances like donuts, cookies, alcohol, a smoke, or some kind of treat to distract us for a little from whatever we’re doing so we can return refreshed and ready to engage. The idea behind these bonus tracks is to offer a different option with healthy benefits that contribute to our well-being rather than relying on substances that increase toxicity levels which then our bodies have to absorb and process, like caffeine, nicotine, alcohol, or junk food. For those of us working hard to heal our bodies from the effects of stress and avoid further contamination, or at least making concerted efforts to cut back on toxic habits, these tracks provide a tool as an alternative to help individuals engage in behaviors that uplift the spirit and build self-esteem. When we feel confident, we are motivated to perform our best and ultimately achieve higher outcomes. A word of caution, however, this state of mind can also produce infectious personalities that tend to inspire others around them to raise the bar. You may find yourself in a happier state of mind, feeling better, and even enjoying more quality relationships. Those are the changes I continue to experience now that I have included mindful practices as part of my regular schedule. Try it … what have ya’ got to lose? Well, that’s it for this week. My team and I are going to take a little time off for a short summer break. We will return again September 1st with all new posts. Until then, enjoy this season and stayorganized.